Earlier this year I posted an Egghead Quiz. We love to hear from readers about our posts and this one got lots of responses. One reader indicated she wished I had also addressed eating egg whites vs the whole egg. This got me thinking and doing some additional research in this area. Like many of you, I’ve been teaching healthful living and nutrition-related topics for many years and the “bad guys” seem to come and go. This is based on current research and longitudinal studies. As I tell my students, as we learn more, we know more and things change. 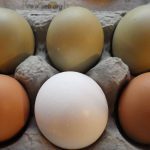 Eggs (and specifically the yolks) used to be one of the “bad guys”. What we were talking about here was cholesterol and the belief that eating eggs and other foods containing dietary cholesterol increased the risk of heart attack and cardiovascular disease. Early versions of the Dietary Guidelines for Americans (DGA) recommended that cholesterol intake be limited to no more than 300 mg per day. This is no longer believed! The 2015 DGA do not contain this recommendation because research does not show a relationship between dietary cholesterol and serum cholesterol. Cholesterol is no longer considered a nutrient of concern for overconsumption. The American Heart Association recommendations agree with this. 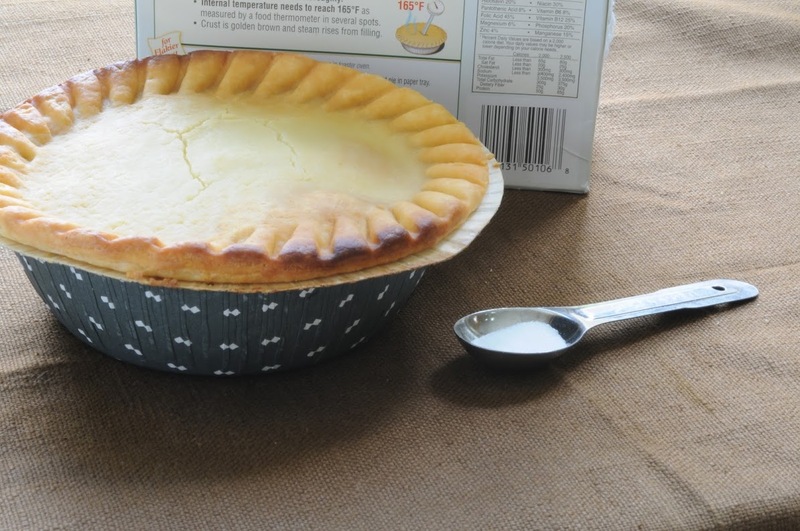 The 2015 Dietary Guidelines for Americans encourage the consumption of healthy dietary patterns that contains all foods and beverages at an appropriate calorie level while limiting saturated fats, added sugars and sodium. 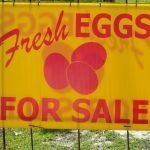 Saying that, where do eggs fit in? They can be part of a well-balanced healthful diet. 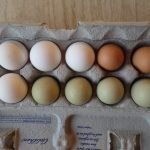 According to the USDA Nutrient Data Base one large (50 grams) hard-cooked egg contains 78 calories, 6 grams protein and 5 grams of fat (1.6 g is saturated, 2 g monounsaturated and .7 polyunsaturated) and varying amounts of 13 essential vitamins and minerals. 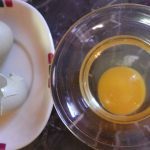 While egg whites contain almost half of the egg’s protein along with riboflavin and selenium, the majority of the nutrients are found in the yolk. If you break it down, the yolk contains all of the egg’s fat and 76% (59) of the calories, 42% (2.52 g) of the protein and all of vitamins A, D, and B6, zinc, iron and choline. Egg yolks are one of the only foods that naturally contain vitamin D.
The biggest concern about eggs would be about in the area of saturated fats. Animal products, including eggs, do contain saturated fat, which can raise blood cholesterol. Too much bad (LDL) cholesterol in the blood can contribute to formation of plaque and narrowing of the arteries. The DGA recommendation is that less than 10% of your total daily calories come from saturated fats. For someone eating 2000 calories a day that’s about 13 grams of saturated fats. While the numbers are small, if you are concerned about saturated fats and calories you could choose to eat one whole egg plus two egg whites instead of two whole eggs. But, don’t skip the yolk altogether, it contains a lot of the “good guys”. Whoa – this means a 4 egg omelette cooked in a tablespoon of butter with one ounce of cheese would rake in 533 calories and over 30 grams of fat. Go with a 2 egg equivalent and prepare them scrambled with a little cooking oil spray in a nonstick skillet or poached or hardboiled. Skip the butter and cheese. A recent study published in Clinical Nutrition looked at data from the PREDIMED study, which featured over 3,000 subjects with elevated risk for heart disease, but without type 2 diabetes. The study found that after 4 years, participants with the highest intake of legumes had a 35% reduction in risk for diabetes. The study was led by Jordi Salas-Salvadó from Rovira i Virgili University, University Hospital of Sant Joan de Reus, and Institute of Health Carlos III in Spain. Salas-Salvadó explained that substituting legumes, especially lentils, for other high-carbohydrate or high-fiber foods was linked with this reduction, though more research is needed to solidify the results. In this prospective study, Salas-Salvadó and his team reviewed diet histories of diabetes-free subjects, both at the outset of the study and then annually for four years. Using regression models to estimate hazard ratios and confidence intervals, incidence of type 2 diabetes in the subjects was measured based on dietary intake. 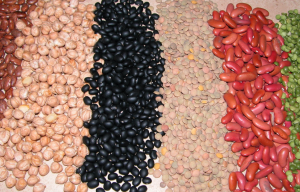 Compared to lowest intake of legumes (approximately 1 ½ servings per week), participants with the highest consumption (approximately 3 1/3 servings), had a 35% lower risk of getting type 2 diabetes. The researchers compared types of legumes consumed and found that lentils in particular were linked with a 33% reduction in diabetes risk. This was observed with just one serving of lentils per week versus less than ½ serving. Chickpea consumption showed a smaller impact on lowering the risk of diabetes, while other dried beans and peas showed no significant link. The authors suggest that substituting half a serving of legumes daily in place of a half serving of grains or high-protein foods (such as eggs or meat) may aid in reducing the risk for diabetes. A recent study published in the Journal of Clinical Endocrinology and Metabolism suggests that “metabolically healthy obese” people, a subset of obese individuals who were initially thought to not be at high risk of heart and other chronic diseases, still might have elevated health risks. Study author Kristine Faerch from the Steno Diabetes Center in Copenhagen states that while it was once thought that it was not unhealthy to be overweight or obese if you lived a healthful lifestyle, newer research suggests that this is not the case.1 Overweight and obese individuals face an increased risk of type 2 diabetes and heart disease. 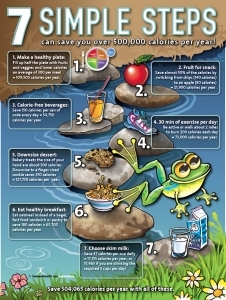 To lower risk, maintaining a healthy weight throughout the lifecycle is vital. Faerch and her team of researchers evaluated data from over 6,200 men and women that joined a Danish study wherein they were tracked for over 10 years. 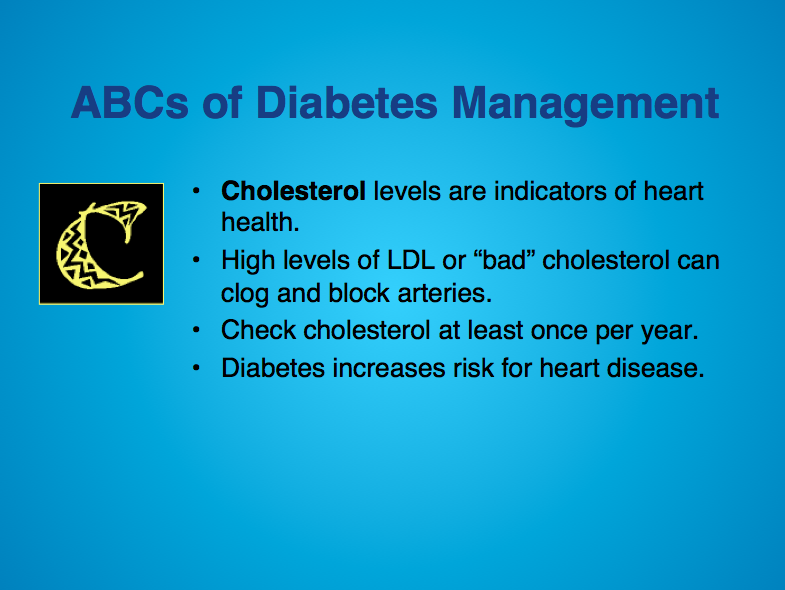 The subjects’ initial BMIs and risk factors for heart disease (including HDL a.k.a. 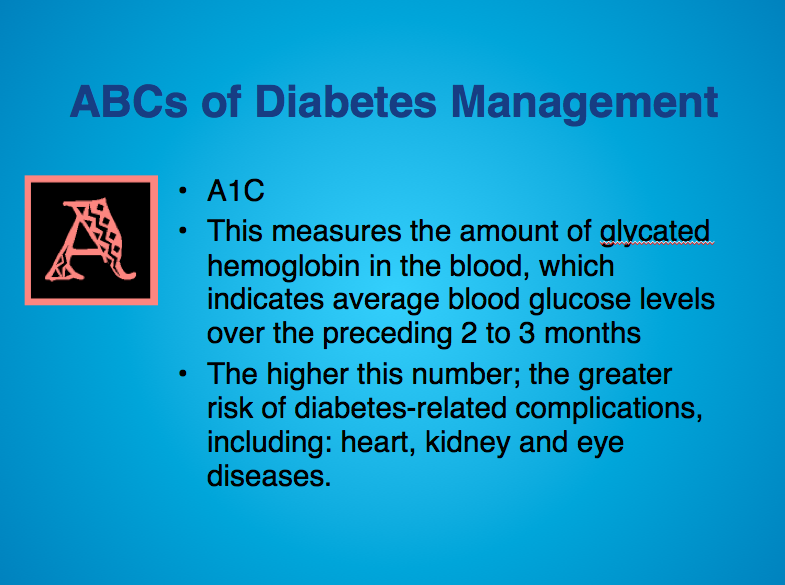 “healthy” cholesterol levels, high blood pressure, triglycerides, and blood glucose) were all monitored. 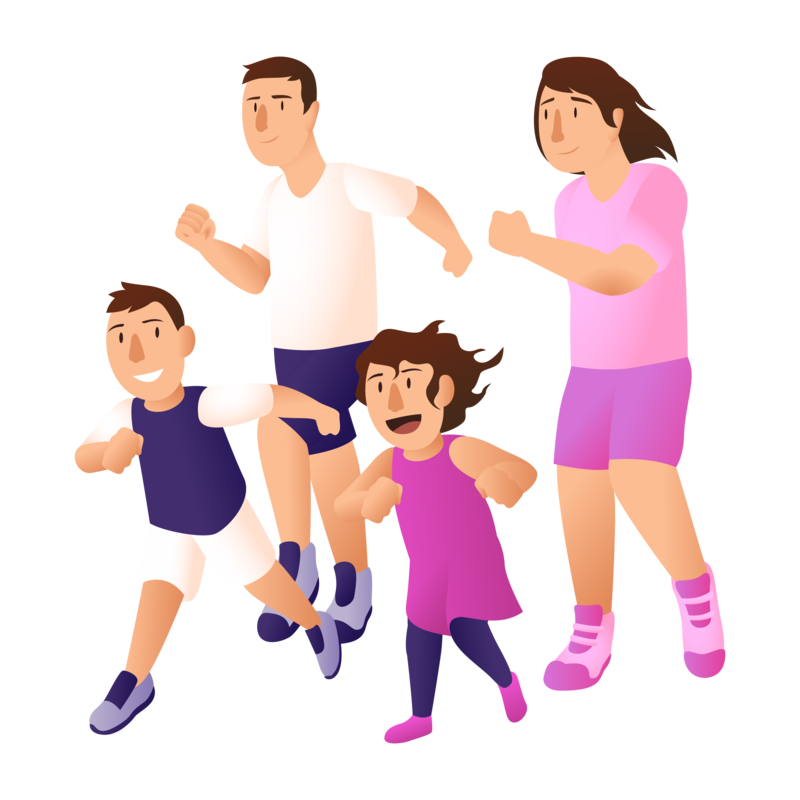 “Metabolically healthy” subjects had none of these risks, while “metabolically unhealthy” subjects were defined as having at least one risk factor. In the follow up period, 323 subjects developed heart disease. Men who were metabolically healthy but obese had 3 times the risk of heart disease when compared to metabolically healthy men at a normal weight. 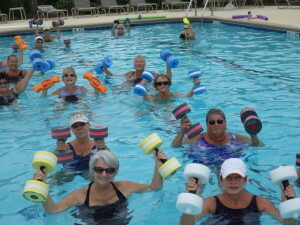 Women that were metabolically healthy but obese had double the risk of heart disease. Overweight men that were metabolically healthy had equivalent risk as their normal weight counterparts. 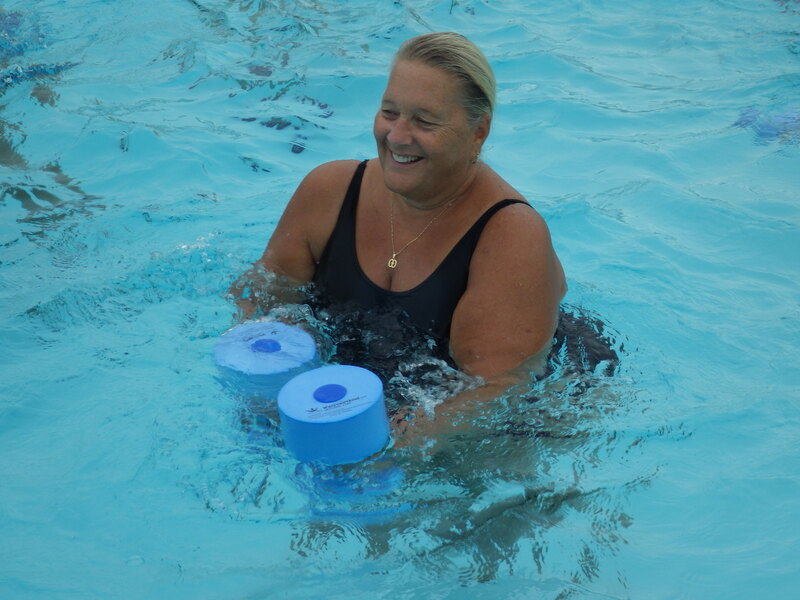 Overweight women had a slightly higher risk than normal weight subjects. The authors note that only 3% of male and female subjects were obese, but considered metabolically healthy. Over a 5-year period, 40% of those considered metabolically healthy became metabolically unhealthy. Joshua Bell from the UK’s University of Bristol was not surprised by these results. He and his colleagues published a paper this past February which noted that obesity increases age-related disability and decline, even in metabolically healthy individuals.2 His research found that after 2 decades, physical ability declined two times more while pain increased six times more in obese individuals when compared to normal weight individuals. Bell further stresses that heart disease is not the only risk factor to consider when discussing healthy aging. Matthias Schulze at the German Institute of Human Nutrition in Potsdam-Rehbruecke believes that other measurements such as waist to hip ratios, waist circumference, and body fat could be explored to determine whether someone is “metabolically healthy” and obese.3 Healthy and obese can change to unhealthy and obese very quickly. 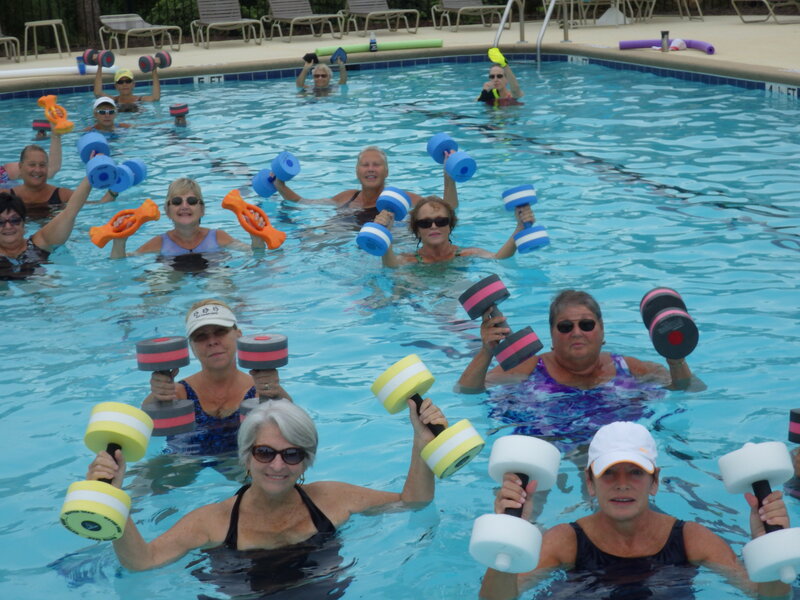 More research is needed to find how to decrease disease risk in both groups. Louise Hansen, MSc, Marie K Netterstrøm, MSc, Nanna B Johansen, MD, PhD, Pernille F Rønn, MSc, Dorte Vistisen, MSc, PhD, Lise LN Husemoen, MSc, PhD, Marit E Jørgensen, MD, PhD, Naja H Rod, MSc, PhD, DMSc, Kristine Færch, MSc, PhD. Metabolically healthy obesity and ischemic heart disease: a 10-year follow-up of the Inter99 study. J Clin Endocrinol Metab jc.2016-3346. Published March 7, 2017. J A Bell, S Sabia, A Singh-Manoux, M Hamer, and M Kivimäki. Healthy obesity and risk of accelerated functional decline and disability. International Journal of Obesity advance online publication 14 March 2017; doi: 10.1038/ijo.2017.51. Christine Meisinger, Annette Peters, Heiner Boeing, Barbara Thorand, Matthias B. Schulze. Update of the German Diabetes Risk Score and external validation in the German MONICA/KORA study. 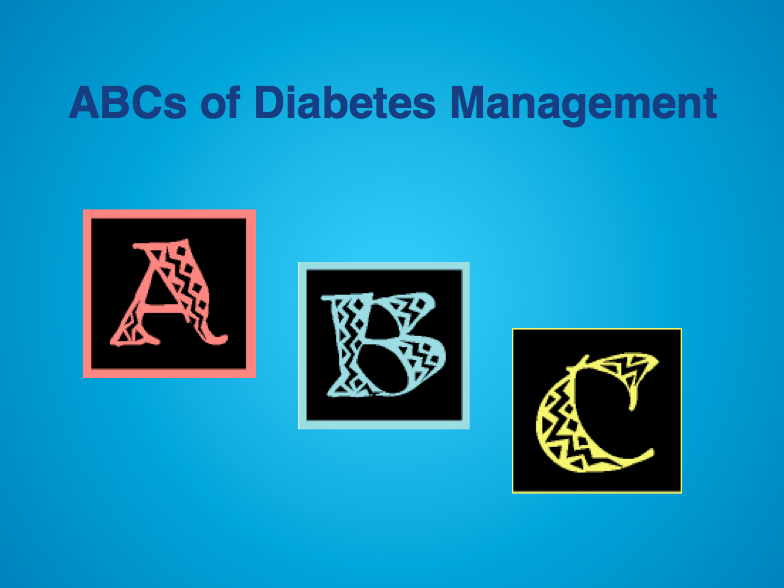 Diabetes Research and Clinical Practice. 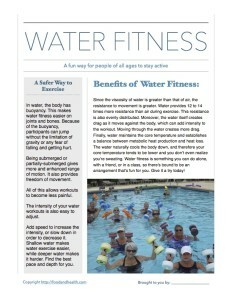 June 2014 Volume 104, Issue 3, Pages 459–466. 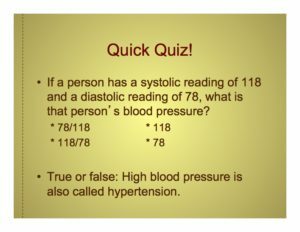 Help educate your audience about hypertension with these free slides, which are excerpted from the top-selling presentation Blood Pressure 101, available now in the Nutrition Education Store. This little preview will also include the speaker’s notes for each slide, so welcome to today’s show! 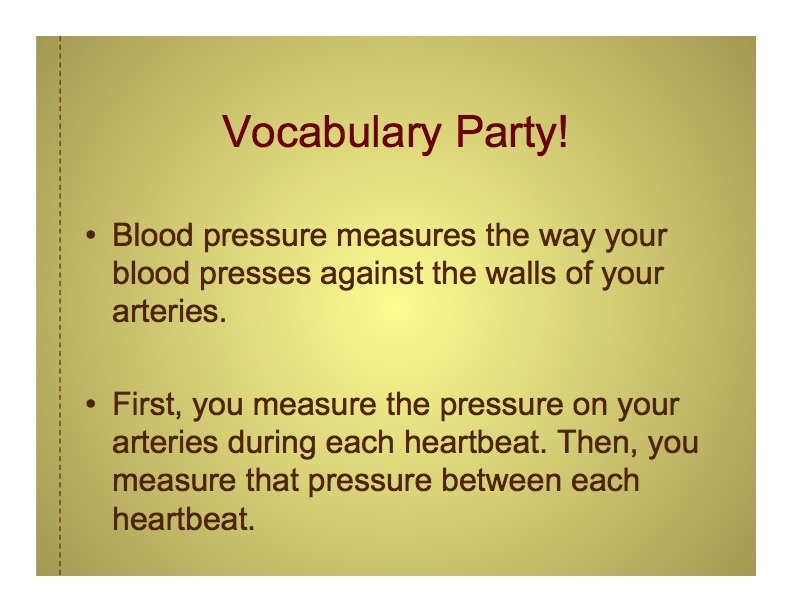 At this presentation, we’ll discuss what blood pressure is and how to measure it. 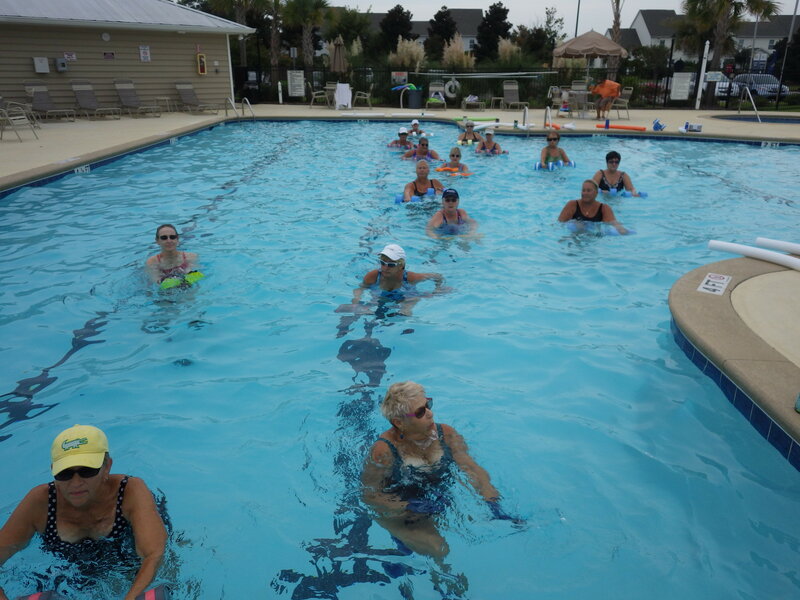 We’ll also cover the effects of hypertension and how you can lower your health risks. 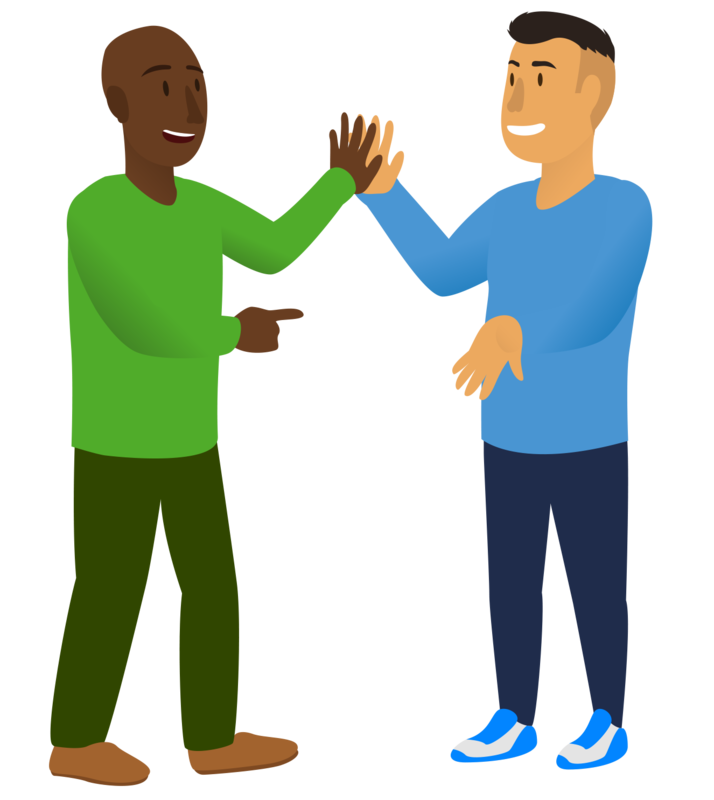 First let’s talk vocabulary. Blood pressure measures the way your blood presses against the walls of your arteries. To measure it, first a doctor will measure the pressure on your arteries during each heartbeat. Then that doctor will measure the pressure on your arteries between each heartbeat. When you measure pressure on the arteries during each heartbeat, it’s called taking the systolic pressure. 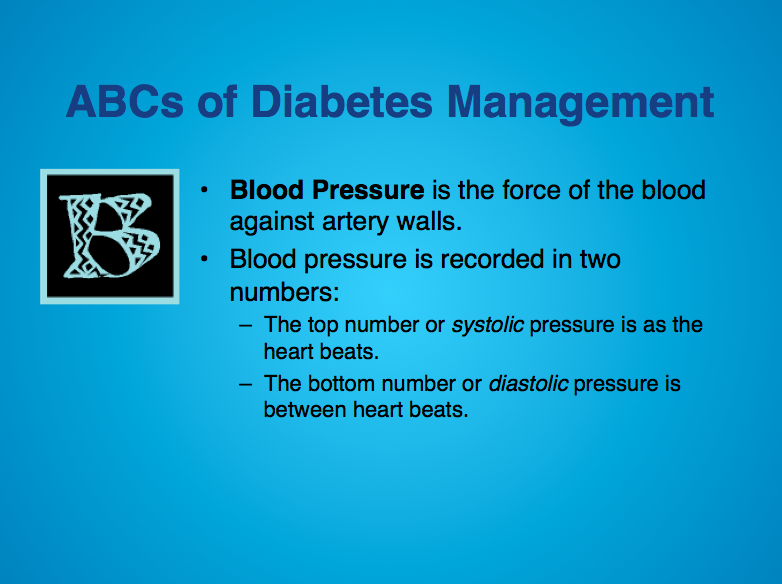 When you measure pressure on the arteries between each heartbeat, it’s called taking the diastolic pressure. As you age, your diastolic pressure generally decreases and you should pay more attention to systolic blood pressure. However, you should never ignore your diastolic blood pressure. In fact, when you’re young, that’s the number you really want to watch. A doctor generally looks at both your systolic and diastolic numbers when determining whether or not you have high blood pressure. How the two factors interact is important, as is the level of each. High blood pressure is also called hypertension. 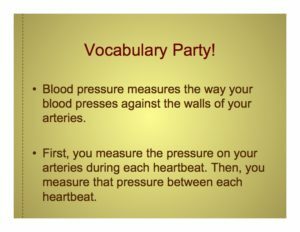 Now let’s take a look at how to interpret blood pressure results. 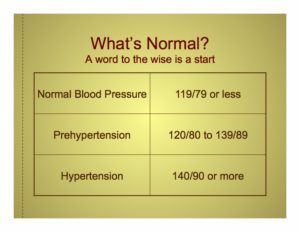 Normal blood pressure is 119/79 or less. 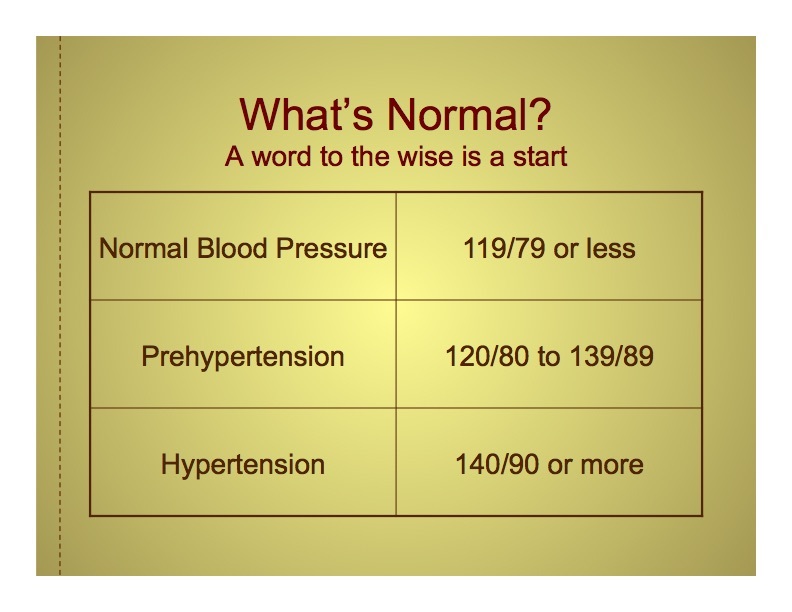 If your blood pressure is between 120/80 and 139/89, then you have prehypertension. If your blood pressure is 140/90 or more, then you have hypertension. Ah! It’s time for a quiz. 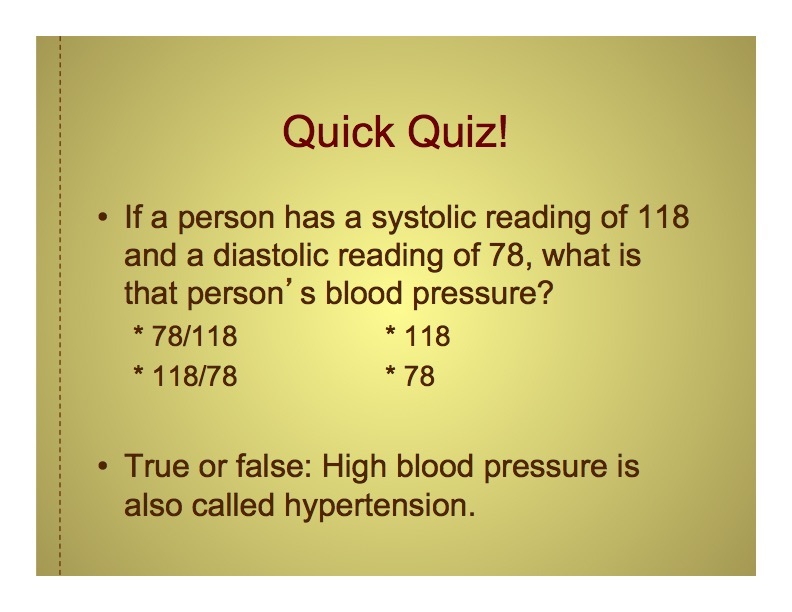 Now, If a person has a systolic reading of 118 and a diastolic reading of 78, what is that person’s blood pressure? The correct answer is 118/78. Let’s move on to the next question. True or false? High blood pressure is also called hypertension. That answer is true! 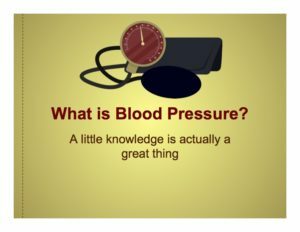 The PowerPoint goes on to explore the health effects of high blood pressure, how to test blood pressure and interpret the results, and how to treat and even prevent hypertension. 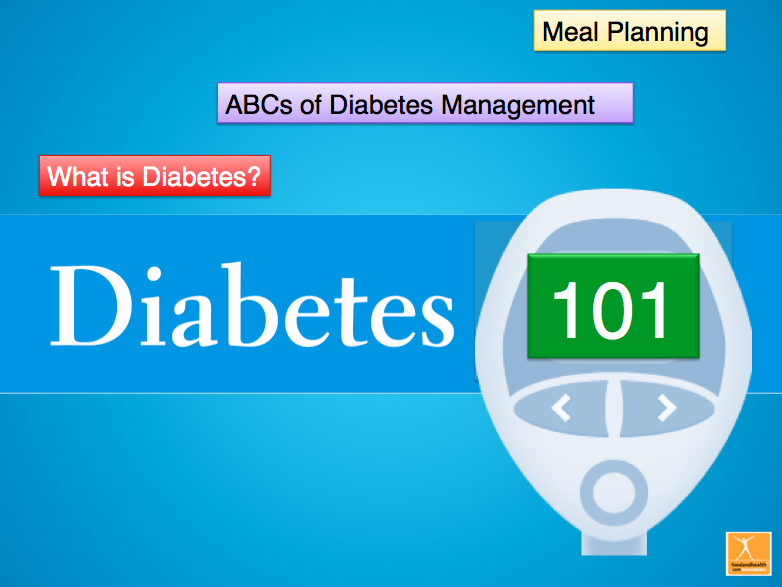 The presentation is peppered with quick quizzes to test knowledge and promote participant engagement too. If you like what you see, consider getting the whole show! And of course, here are PDF copies of the slides we featured today. What will you do with yours? And here are some more materials for High Blood Pressure Education Month! 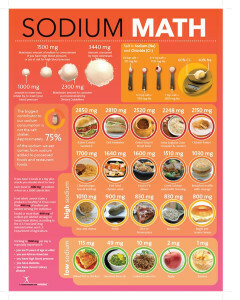 Have you seen the Sodium Math poster yet? We released it shortly after the Dietary Guidelines for Americans debuted earlier this year. 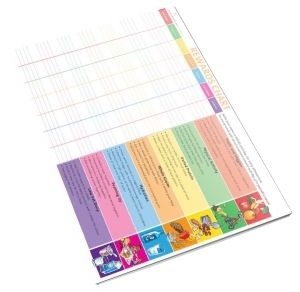 It’s a fantastic resource for displays, presentations, and even simple office decoration. With engaging questions and alluring graphics, this poster teaches valuable lessons about salt in a memorable way. Of course, putting it together was no mean feat. Today I want to walk through the process of creating this poster — I figured it would be useful for your own designs and displays. There were even 3 top lessons that we learned as we put the poster together! Plus, sodium is one of those food elements that most people don’t know enough about. You see, once the latest edition of the Dietary Guidelines for Americans was officially released, I just knew that we had to create some kind of visual guide to dealing with sodium. But what? And how? 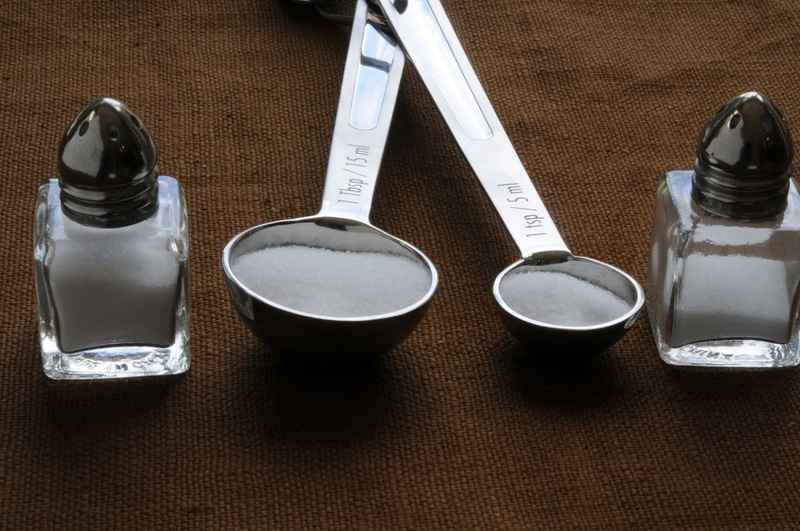 There’s always a lot of confusion about where sodium comes from in our daily diets. People hear the word “sodium” and they automatically equate that with “salt shaker.” However, the salt shaker is only responsible for a tiny amount of the sodium that most people consume each day. Most of the sodium (about 75%) comes from what is present in restaurant meals and packaged meals from the grocery store. 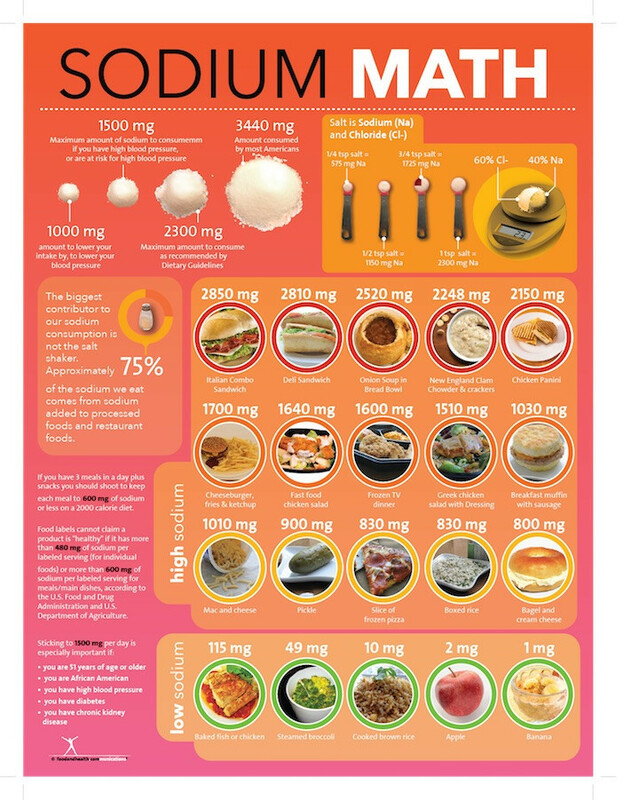 The Sodium Math poster is an engaging visual that shows how much sodium we are actually consuming versus how much is the maximum for good health. It’s a bit of a shock to see the big pile of sodium that we eat each day and to see the teaspoons of sodium that each food contains! To balance that shock, the poster also showcases many fresh foods that are low in sodium. The poster clearly illustrates the lesson that a little work to eat 1,000 mg less sodium per day can make a big change in blood pressure. One of the biggest shocks to us in the research was about how much sodium is in fast food. Turkey sandwiches sound healthy, but a turkey deli sandwich has 2,810 mg of sodium. That’s almost a 2 day supply! After reading this poster, we devoted more effort to making “planned overs.” (That’s when we cook extra food for dinner and eat it for lunch the next day). Cooking your own meals at home can make a huge difference in your health, especially when it comes to sodium. The Dietary Guidelines for Americans 2015 recommend that just a small shift to lower sodium intake by 1,000 mg per day can make a positive impact on lowering blood pressure. 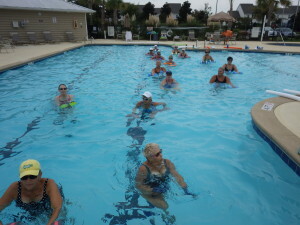 This lesson was new to us and it seems relatively easy to implement. Plus, everyone loves an easy math lesson! 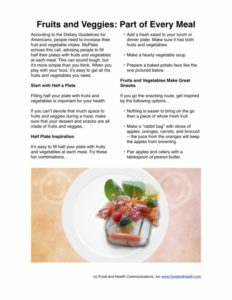 We chose math because we wanted a way to explain sodium, salt, sodium intake, recommended sodium intake and changes needed, along with engaging food photos that can illustrate the whole lesson quickly. So there you have it! A little peek behind the curtain and 3 lessons we learned while creating the Sodium Math poster. As a special bonus, here’s a copy of one of our top printable sodium handouts! 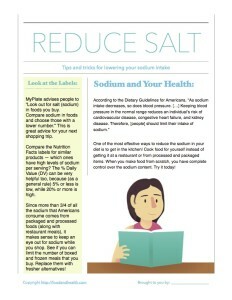 Reduce Salt has lots of tips and tricks for lowering the sodium in your diet. Get your free copy today! 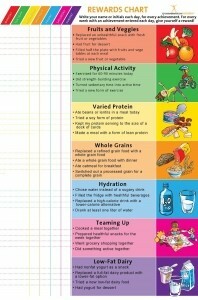 One of the most popular tools in my nutrition educator’s bag of tricks is a good reward chart. It helps with motivation, makes it easier to celebrate important milestones, and adds a sense of fun to a new endeavor. That’s why I created the Reward Chart poster. I wanted a resource that would help people focus on important health goals, and it has been flying off the shelves since its introduction to the store. Today, because I love ya, I’m giving away the handout that comes with this poster, for free. There are tons of benefits to good health. Congratulations on starting down the road to good health. 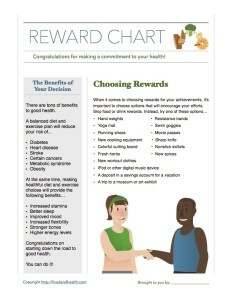 And, as promised, here is the PDF handout that’s (usually) only available to people who already bought the Reward Chart poster. I hope you like it! Last but not least, we have some other great resources in the Nutrition Education Store — they’re sure to give your clients a motivation boost! 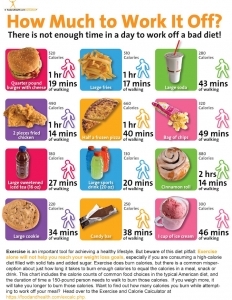 Poster: How Much to Work it Off?